TechnoMark recently introduced a Minecraft bundle of this device I’m about to review, but we actually were sent a physical model to review, so this entry will be about GameVice for the iPhone. 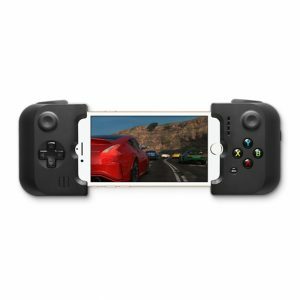 GameVice is a game controller that you can fit your iPhone (there’s also one for the iPad, and another one for Samsung Galaxy S8 and Note 8 as well) in, and play video games in the palm of your hand. Similar to a Playstation controller, it has a little joystick on either side, and the little up/down,left/right cross on the left side. Instead of geometric shapes on the right, there are four buttons labeled A, B, X and Y. There are even the shoulder buttons on the top- or front of the controller (however you would view it). They are the L1/L2 and R1/R2 buttons. So basically, this gadget is made to turn your phone into a gaming console. It’s reminiscent of a Nintendo Switch. There are games you can download off the Gamevice Live app that curates games you can play with a map to the controls for each game and a link that allows you to download for the Apple Store (or Google Play- depending on your device). 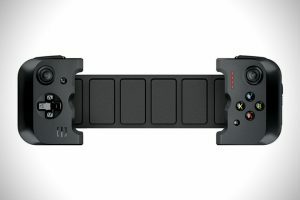 There is no extra battery needed for the Gamevice. It simply runs on your phone’s battery. If you need to charge your phone, you can charge it through the console while you are playing. There is also a earbud jack to plug into so others around aren’t disturbed by the noises coming from your game. You’ll want to make sure you get the correct one for your phone or tablet. The one we received to review fits the iPhones 7, 7 Plus, 6s, 6s Plus, 6 and 6 Plus. This means that it can accommodate a few different sizes. Once you insert it in to the Lightning connector and get the other side around your phone, it will hold pretty securely. When not on your phone, it’s accordion style back folds up for compact storage. If you buy the Minecraft bundle that TechnoMark talked about (linked above), you get a cool case to put it in. 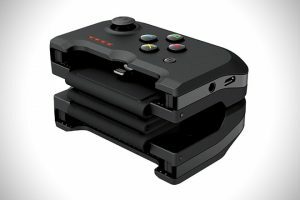 As it is, the Gamevice for the iPhone has a listed price on their website for $79.95. You can also buy it in Apple Stores. Gamevice sent us this model to review free of charge. No other compensation has been received for our unbiased and fair impression.